Last month, this blog turned nine years old. While that’s a scary thing in of itself (I’ve been writing about booze for about a quarter of my life), it also shows me how long it’s been since I first met (at least virtually) some of the folks in the whisky blogging world. I’ve known Gal Granov from WhiskyIsrael for almost a decade and now, after years of me sending him whisky from work, he has returned the favour and sent me a sample of a dram that he’s bottled – The Holy Dram Inchmoan 2004. I’m a member of a lot of whisky groups on Facebook, and a while back Gal added me to another one. Almost every post is in hebrew – a language that despite occasional attempts to at least learn what the letters look like, I do not have any clue about – and there are lots of posts. I don’t join in very much. I think this is Holy Dram IL (although Google translate tells me the group’s name translates as ‘Alcohol lovers who also understand this, superior and superior’), a group started by Gal and some friends about a year ago. As of writing they have 4,415 members, lots of posts and, as of now, a bottling. It’s an Inchmoan, distilled at Loch Lomond. As I’ve mentioned in blog posts passim, I rather like Loch Lomond. Since being bought out a few years back, they’ve gone from being a purveyor of anonymous supermarket blends and famously awful single malts to a creator of excellent malts and anonymous supermarket blends. They distil a whole raft of makes – 13 plus grain according to my blog post on the matter – and bottle them under different names – Inchmoan is a smoky one. 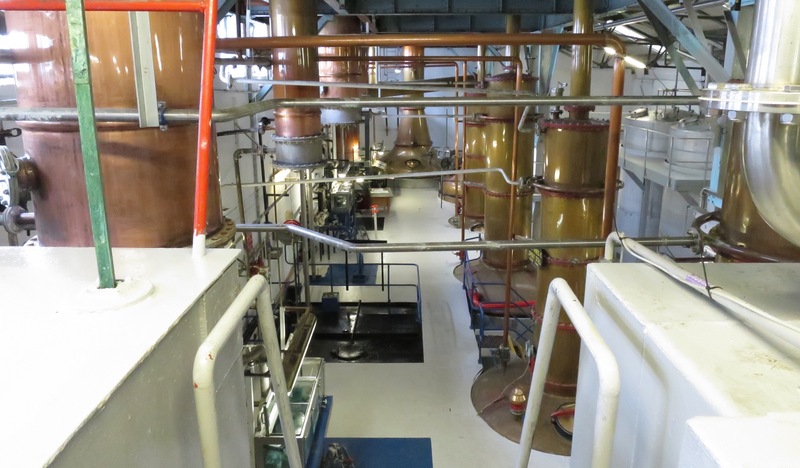 The still room at Loch Lomond – straight- and swan-necked stills on display. They have four types of still at Loch Lomond: a traditional continuous still used for grain whisky, a slightly more specialised continuous still that they run malted barley through (used to create their single grain whisky), traditional pot stills (which they call ‘swan-necked’ stills) and their own special ‘straight-necked’ stills. The straight-necked stills are intriguing, because for a while they were called by a different name – Lomond stills. Not named after the distillery (they were invented by a Hiram Walker chemical engineer by the name of Alistair Cunningham and initially installed at the company’s distilling complex at Dumbarton) they add a series of plates in the neck of a pot still. These act like the plates in a column still, creating increased reflux and a different character to regular pot-stills, as well as helping the still to produce a higher alcohol spirit. The plates were also adjustable, allowing them to be removed from the distillation process, making the still even more versatile and able to create different styles of spirit. Anyways, Loch Lomond no longer have Lomond stills. They now have straight-necked pot stills. Which are totally different, despite being the same stills. From talking to people who know about such things, I think everything was resolved by fixing the neck plates in place, rather than allowing them to be adjustable. I’m not entirely sure how this sated the SWA, but Inchmurrin and Inchmoan, as well as Loch Lomond’s eponymous whisky, are all single malts, and the Loch Lomond Group are now members of the SWA. All sorted. I assume. 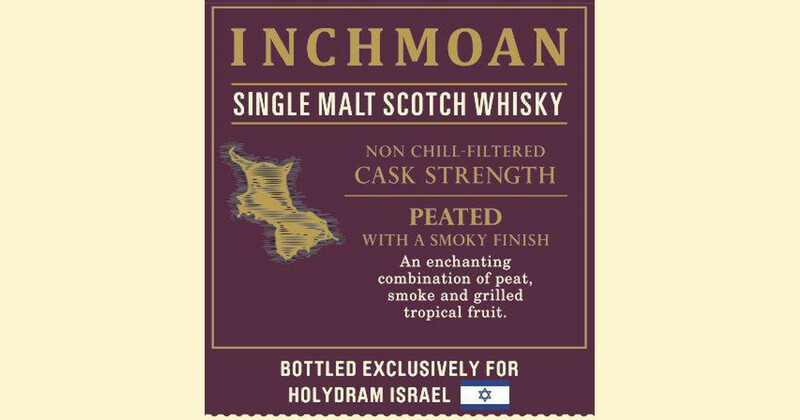 Inchmoan is a mixture of straight-necked distillate collected at both 85% and 65% ABV – one of the advantages of Loch Lomond’s shiny definitely-not-Lomond stills (although, I’d assume they’d get different strengths by adjusting the neck plates…) – with a bit of regular pot-still in the mix as well. 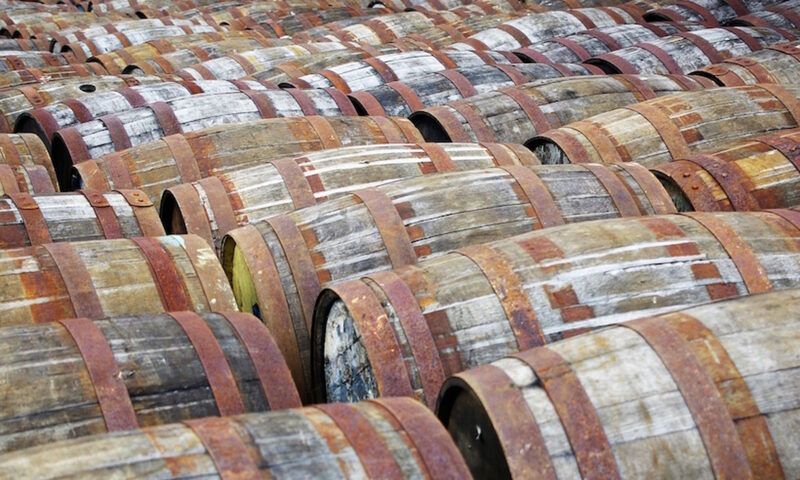 It’s made with heavily-peated barley – about 50ppm in the barley – and mostly matured in bourbon casks. In other news, I rather like it. The regular Inchmoan 12 Year Old is a nice dram, but the rather-pricy 1992-vintage is one of my favourite whiskies of the past year. 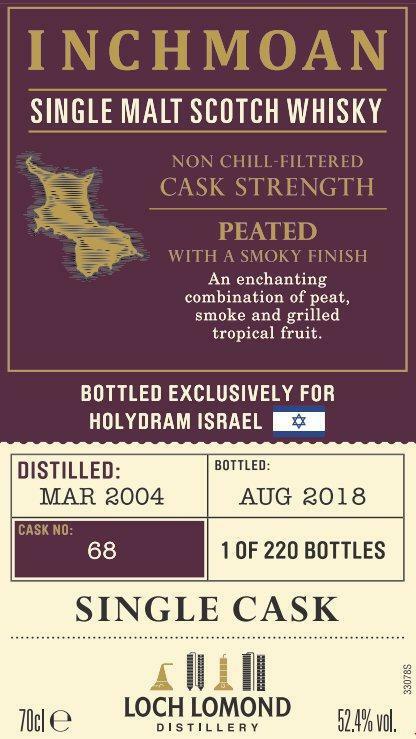 The Holy Dram Inchmoan was distilled in March 2004, matured in an ex-bourbon hogshead for 14 years and bottled in August 2018 at cask-strength, 52.4%. Nose: Ashy smoke and a pile of fruit – a fruit bowl in a fireplace. Apples and pears lead to papaya, lemon and a touch of unripe mango: 1990s-bottled Laphroaig fruitiness. Oat & raisin cookies and cinnamon biscuits develop, and waxy grapefruit skin hides at the back with a touch of vanilla cream. Palate: The fruit from the nose is right up front – mango, papaya, cinnamon apples and candied grapefruit. There’s also a touch of creamy banana and a layer of ashy smoke: bananas wrapped in foil and left in the ashes of a bbq to roast. Gummi bears and wine gums emerge, with a touch of spice as a chaser. Under everything is a stony minerality, liquorice, damp ferns, coal smoke and cold peat ash. Finish: Ash and minerals fade to leave, as you’d expect, fruit – mostly orange wine gums. In short – I really like this. It reminds me of the 1990s’ bottlings of 10-year-old Laphroaig that m’colleague Mr Forbes fed me back in my early days at The Whisky Exchange. They were (mostly) excellent, and forced me to become a fan of the distillery. I also blame his enthusiastic promotion of 1990s Laphroaig 10 for the subsequent rise in its price. That and this love letter he wrote to the distillery. But enough about Laphroaig, this is Inchmoan. Loch Lomond has firmly set its sights on producing a fruity and smoky whisky that harks back to the olden dayes of Islay whisky production. Well, the 1980s at least. Something that I rather like. So, The Holy Dram Inchmoan 2004 gets a thumbs up from me. An excellent selection by the Holy Dram gang, and hopefully not the last. I now await the delivery of my own bottle – ordered within moments of writing my tasting notes. Drop Gal a line if you want one of your own. Inchmoan 2004, 14 years old, 52.4%. Bottled for Holy Dram IL. About £100 a bottle. You can read Gal’s tasting notes and find details of how to order over on WhiskyIsrael. thanks billy for your excellent blog (and lovely tasting notes) Loch Lomond are indeed full of surprises! I am also glad you liked the profile, i thought exactly the same (old laph) the minute i first tasted the cask sample. and Yess. we’re working hard on more HolyDram releases. Next PostNext Is Lidl Queen Margot 8 Year Old the Best Whisky in the World?